Hanoi (VNA) – The Vietnam Sustainable Energy Alliance (VSEA) said the country lacks a set of standards for the development of solar power, which is abundant and untapped. The comment was released at a VSEA conference on trends and challenges in the sector held in Hanoi on August 21. Vietnam is among countries that enjoy the most sunlight in the world, with the Central Highlands and south central regions recording between 2,000 and 2,600 hours of sunshine every year. 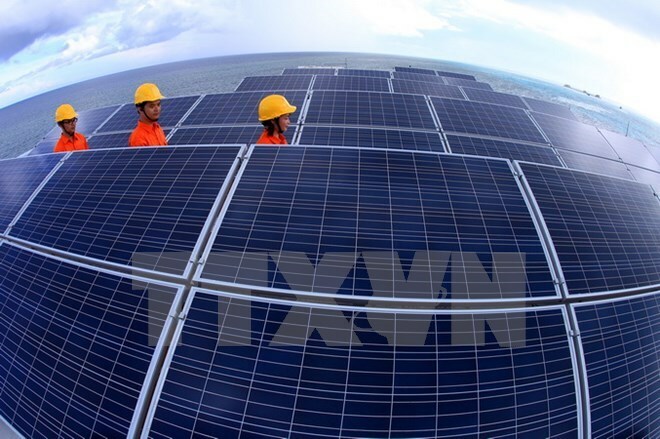 However, most solar power projects in the country are small scale, with only the under construction Quang Ngai grid-tied solar power project at a large scale. Experts said the biggest challenge is unattractive selling prices of solar energy, while investors struggle to access funds for green power development and face high costs due to the necessity to import most equipment. Do Duc Tuong, Clean Energy Advisor at US Agency for International Development in Vietnam, said a long-term and stable policy on solar power prices is needed to encourage investment. On the other hand, prices of solar batteries have fallen, falling from 4 USD per watt peak capacity to about 0.5 USD per watt peak capacity in the past five years. Participants said this is a good sign for the renewable energy market, but the Government should issue technical specifications to help consumers buy quality products. Hoang Thu Huong, deputy head of the industrial division under the Party Central Committee's Economic Commission, said electricity infrastructure in Vietnam has basically met economic development demand, but still needs further investment to promote renewable energy.